Aluminum alloy shaft is light and corrosion resistant and strong.  HIGH QUALITY & LIGHT WEIGHT -- Made of durable ABS handle and aluminum alloy shaft, our foldable selfie stick tripod features in long service life, lightweight and sturdy to use; No APP required! Simply connect by Bluetooth. 4 in 1 design also makes our products lighter and more functional than other ordinary selfie sticks.  UNIQUE TRIPOD FUNCTION -- Fantastic way to start your selfie happiness. 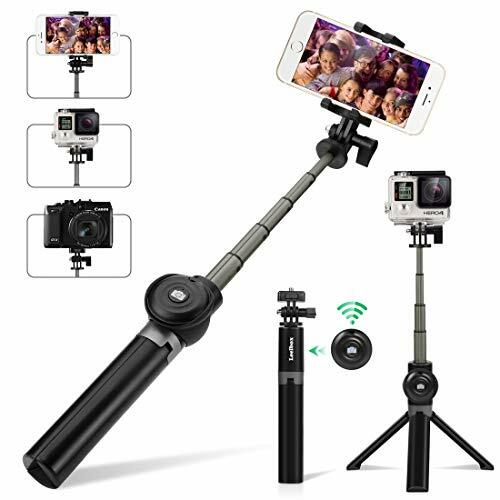 Ingenious design which makes the tripod open or close in one step, with aluminum alloy tripod and non-slip foot pad, the tripod will be more sturdy so you can take group photos, record videos with your friends and families at anywhere and anytime.  WIDELY COMPATIBILITY -- Certificated bluetooth 3.0 device, high speed and low consumption, compatible with iOS and Android smartphones such as Apple iPhone X/8/8 Plus/ 7/7 Plus/6/6s/6 Plus/SE/5S, Samsung Galaxy S9/S8/S7 Note 8/S7/S6. Camera mount and screw are provided, so it fits Gopro camera and digital cameras too.  FOLDABLE TO CARRY -- Foldable and extendable design, easy to carry. 5.2oz weight, 7.87" folded size, its lightweight and convenient to put in pocket or bag during travel; Extendable length up to 26.77". The adjustable phone holder can fit any phone in the market with a width of between 2.2" to 3.42".  ENGJOY LIFE & ENJOY SELFIE -- Detachable Bluetooth Remote, free your hands; Built in CR2032 button battery and can be replaced. 270°adjustable rotations, you could select horizontal or vertical shooting angle, use your phone, Gopro or digital camera to get the best photos. Just enjoy selfie and record wonderful moments in your life!